The world renowned Tulips gardens at Keukenhof, Holland have long been on my wish list of gardens to visit. I had not really planned to visit them so soon, but I suddenly found myself researching a short break. It was then I found a 5 night cruise called Tulips and Chocolates with Fred Olsen, with a specific excursion to Keukenhof - this suited me perfectly. No overnight coach journeys from Shropshire over the English channel and on to Amsterdam. Though Euro Star now run trains from London to Amsterdam, not without a transfer in Belgium initially, and I would still need to get to London from Shropshire. I just do not have the stamina for such journeys. You can of course fly, but that was not an option for me currently. So a cruise would do nicely! My sister and I, both of us equally fanatic about gardening, enjoyed the leisurely cruise from Southampton to Amsterdam and arrived the weekend of the Tulip Festival. 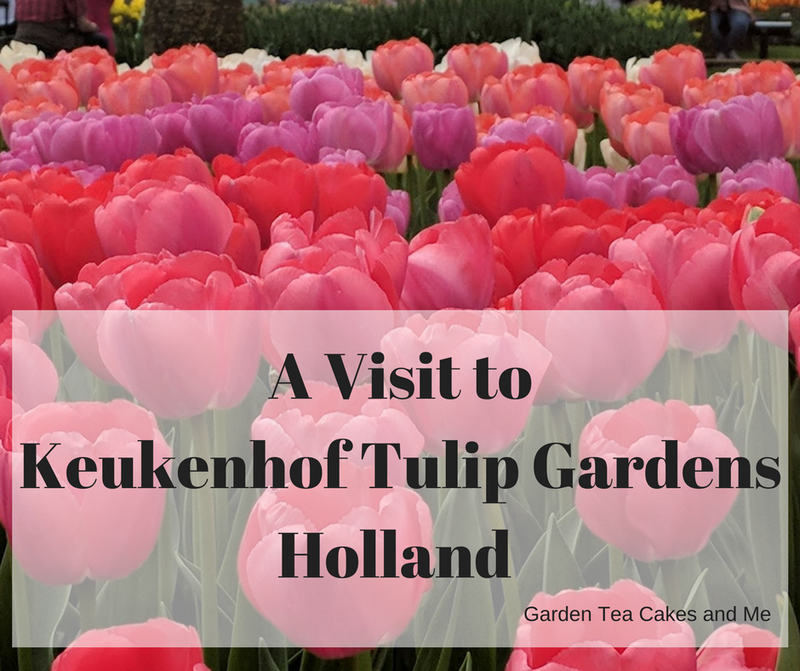 Our trip to Keukenhof gardens was booked for the Sunday, its busiest weekend! To fully explore the Keukenhof gardens I would need use a wheelchair, I am not able to walk such distances. 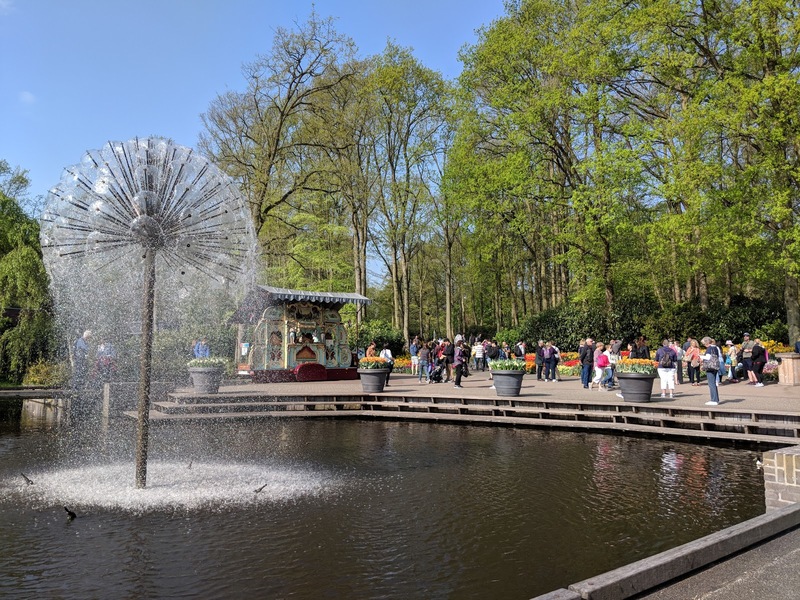 So I was delighted to see that Keukenhof have wheelchairs you can book online before you visit, you pay a returnable deposit of 20 Euros when you collect the wheelchair. We left the cruise ship at 9am,and arrived at Keukenhof gardens just after 10.15am, the roads were very busy as we nearer our destination. En route we enjoyed the fields of colour of the surrounding Tulips fields. 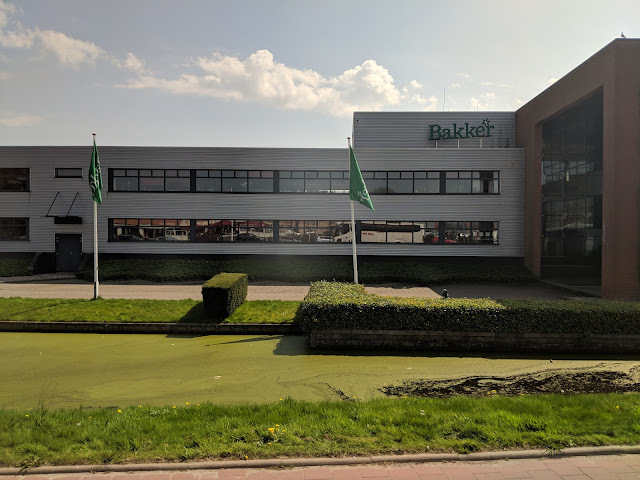 We also passed the headquarters of Bakker the largest garden specialist in Europe, not sure if they are still operating in the UK. Also spotted were a number of floral decorated floats that were used in the flower festival parade the previous day. Wheelchair collected just as you enter the park, and we were off. We were limited by time, we only had 3 hours to explore Keukenhof as our ship set sail at 4pm. There are not just gardens to explore but also numerous flower show pavilions to look around and be inspired by. The weather was very sunny and warm, the leaves on the trees supplied wonderful dappled shade adding to the overall feel of the gardens. Coincidentally my neighbours had visited the week previous and were very disappointed that none of the leaves were out, so worth waiting for in my opinion. The use of water around the gardens was impressive the lakes, ponds, fountains and rills created eye catching scenes. Adding a touch of calm to the crowded chaos. Whilst everyone is there to admire and enjoy the flowers they also all want to take photos and videos, something you need to embrace. I have not hidden the crowds from my photos, this will give you a realistic view of what to expect visiting during peak time. Though we did still manage to find a quiet spot or too to enjoy an ice cream. 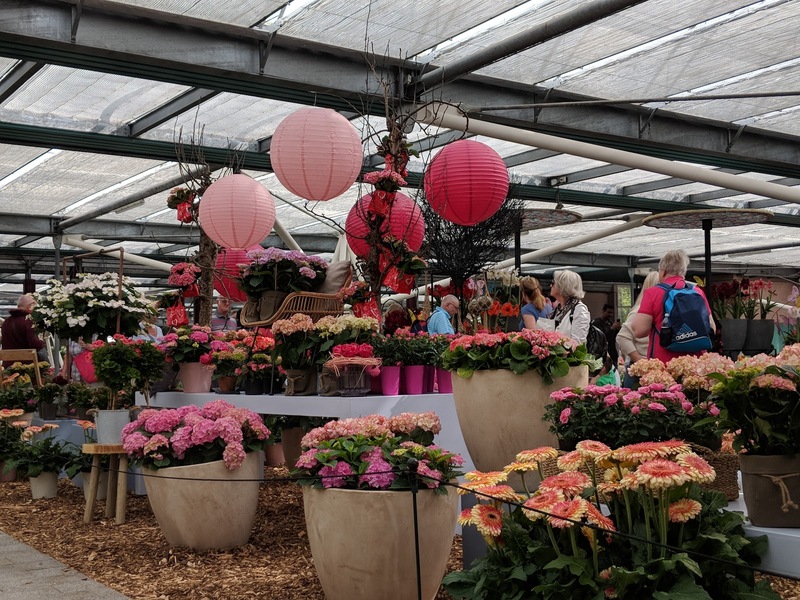 The flower shows in the Willem-Alexander Pavilion had some inspirational arrangements, using many varieties of cut flowers. It was much less crowded in here, so we also took the opportunity to enjoy a nice slice of dutch apple cake. 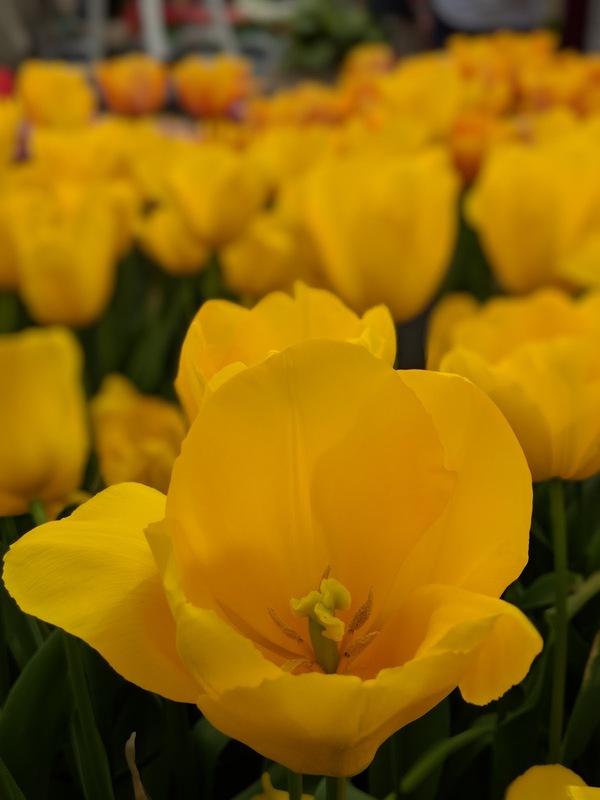 You will find plenty of plant labels within the displays, so if you spot that one Tulip you want to grow back home you can easily source it. 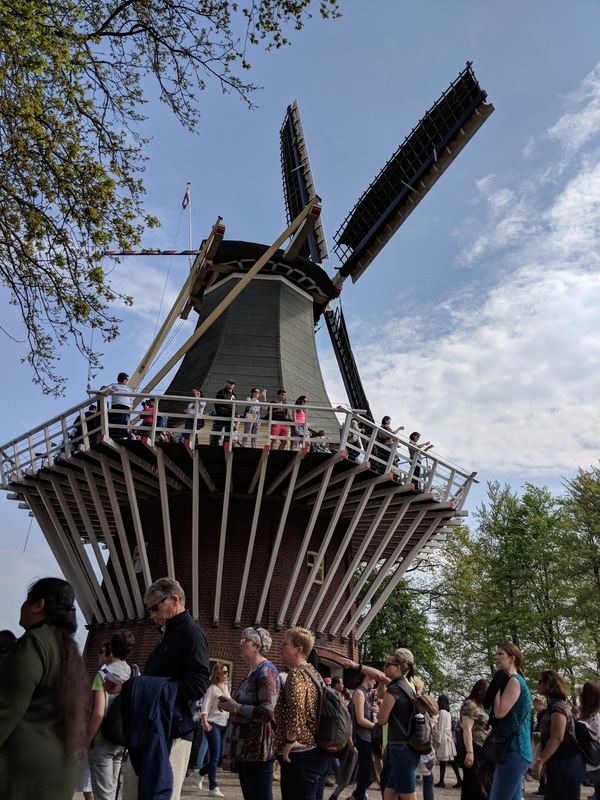 Be prepared to join a long queue for entry into the windmill, where you can enjoy raised views over looking the park and the adjacent bulb fields. Though there is a lovely food stall serving fresh warm stroopwafles, which I can thoroughly recommend! Disappointing that the Tulipmaina pavilion was just so busy when we entered we had to turned around, we ran out of time. You can view the extensive bulb fields from inside the gardens, viewing points are located next to the wind mill and near the petting zoo. These can be busy but people soon move on once they have captured a photo. 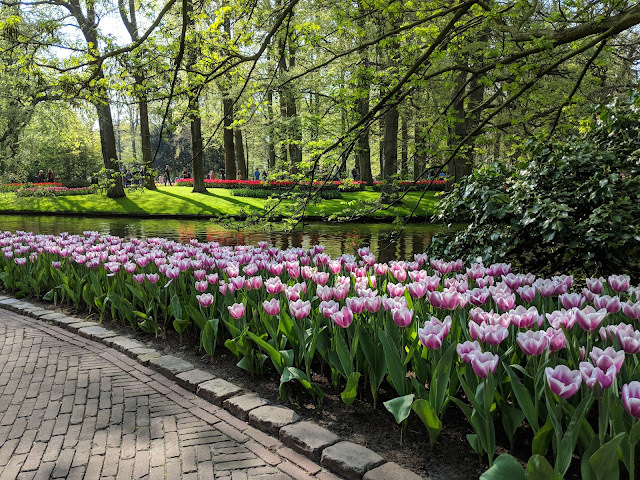 The boat trips within the park looked like a great way to explore the tulips and gardens without being surrounded by crowds. There is a small extra charge for this. Having spoken with a couple on our coach they went straight to the boat hut next to the windmill when we arrived. They really enjoyed a lovely relaxing trip around the gardens, and highly recommended it. Another good way to see the gardens if you have limited walking. Wanting a souvenir to remember your visit? Obviously at this time of year you can not buy tulip bulbs but you can order them for delivery, there were a number of bulb huts located within the park. If you are travelling by coach there are a number of toilets located by the coach park. These are a lot less busy than those at the entrance to the park, worth remembering when you are leaving the gardens to avoid the queues. I shared a number of photos during my visit to Keukenhof on my gardening Instagram account ShropshireGardener, including the one above. I was very surprised but pleased when Gardeners World asked to include this photo in their Keukenhof in Spring feature for their website. That is probably the closest I will ever get to Monty Don! Incidentally you will also see a photo of the Muscari river surrounded with tulips and daffodils opened, you will of spotted a photo above I took where they had yet to open, I think I actually prefer them waiting to bloom. I will certainly be wanting a return visit to Keukenhof. Hope you have found visit interesting, let me know if you have any questions and I will do my best to answer them. What a feast for the eyes, stunning. I am always impressed by disabled facilities whenever we go to Holland. 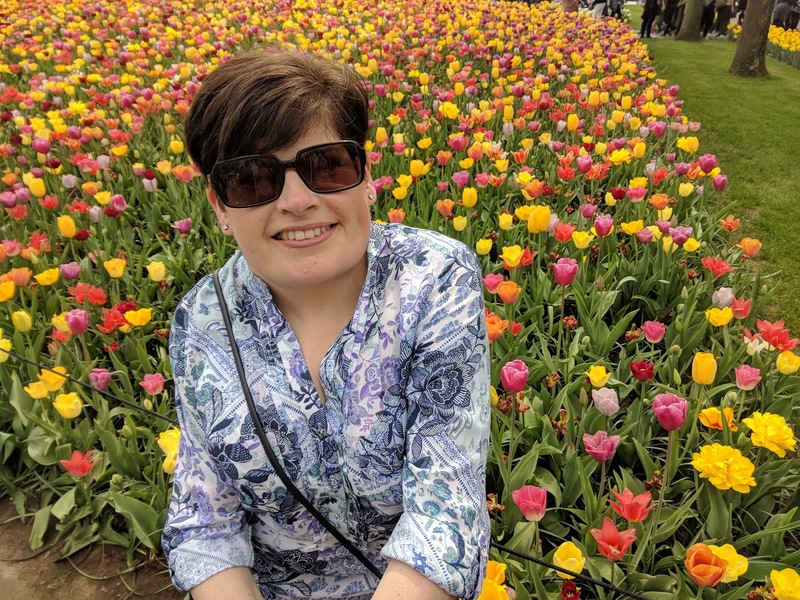 The last time I visited Holland (quite some time ago) I was quite mobile, I've only been using a wheelchair intermittently for a year so I was little concerned about how accessible places would be. But Keukenhof excelled! Lovely photos. 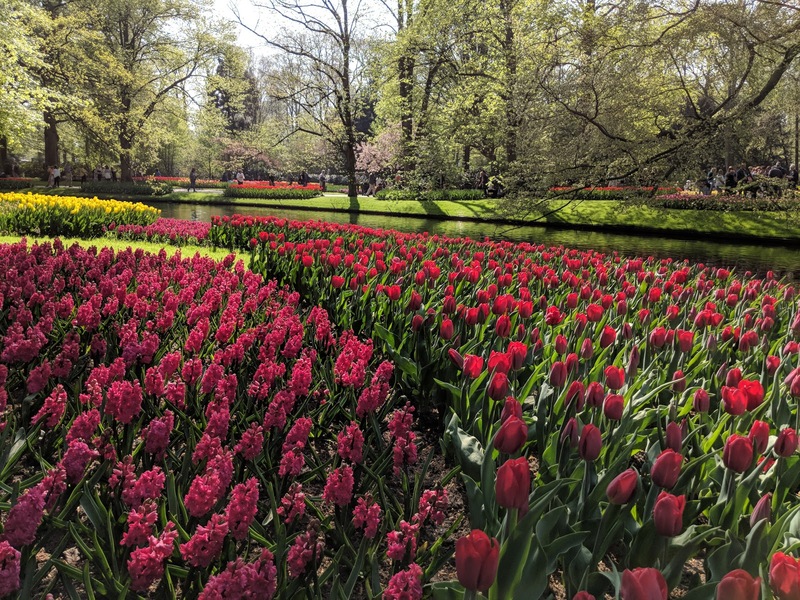 I hope to get to Keukenhof myself one day. I wanted to ask re the 3 hour limit - do they only allow you 3 hours? I assumed you could visit for the day. I have a chronic illness and need to use a scooter/wheelchair to get around as I get easily exhausted, and I know I couldn't do it if I had to squeeze it into 3 hours! I like the idea of the boat trip - sounds much less tiring. Thanks for sharing your visit with us. 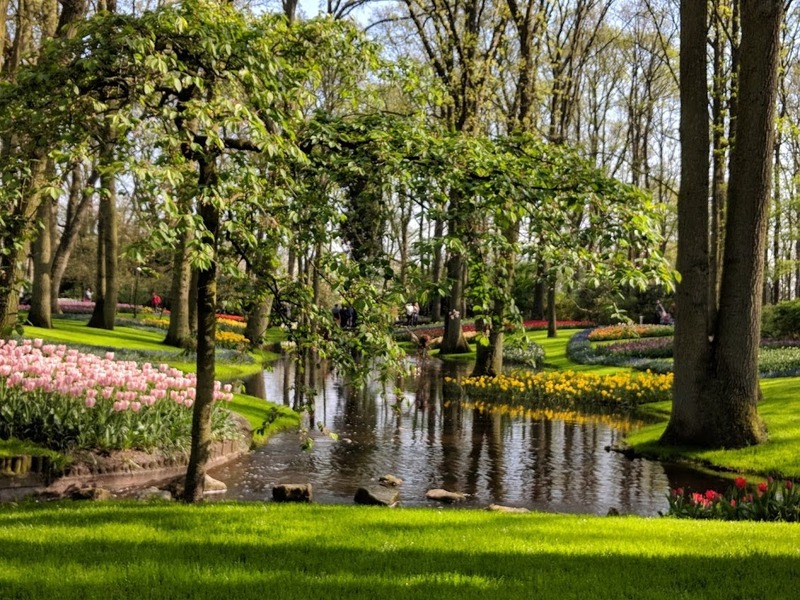 A lovely guide to Keukenhof, which is on my bucket list, so thank you for all the tips. You have taken beautiful photos - not surprised they were spotted! Thank you Ali :) Hope you get to visit it soon.